Need a place where you and your group can be yourself? Welcome to The Space. Hold your gathering - no matter how alternative or unconventional at the Columbus home for alternative self expression. Rentals include chairs, tables, and some AV facilities. Additional furniture (provided by AIS KinkLabs) available for additional fees. Want to hold your event but don't see an option that works for you? Contact us and lets see what we can do! 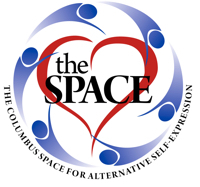 Note: all events at the Columbus Space are for those +19 years up and older. No exceptions.